Introduced in 1975, the Honda GL1000 was a stunning technical achievement. 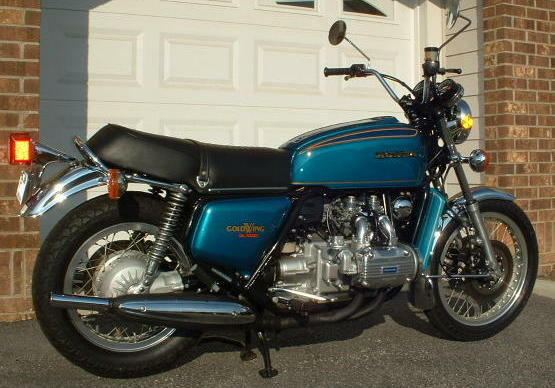 The original, unfaired GoldWing was the world’s biggest, heaviest and second fastest bike available at the time (only the mighty Kawasaki Z1 was swifter). Novel features included a liquid-cooled flat four engine, belt-driven overhead cams, shaft drive, triple disk brakes, under-seat fuel tank, counter-rotating alternator, two oil pumps, “floating” piston pins, faux top shelter “tank” and detachable back-up kick-start arm to mention a few. Honda used the GL1000 to showcase its considerable engineering prowess and put other motorcycle marques on notice that it was a force to be reckoned with. For the first time ever, there was heavy collaboration between Honda’s motorcycle and automotive engineering teams on the ’75 Wing.